If you have not yet made it to the gym, fear not. Exchange that new year’s resolution for another: learn a new language. But make sure you learn one which has a more practical purpose than ordering a drink or finding one’s way to the swimming pool. It’s time to learn the lingo of bankers and tax advisors – you’ll need it for 2014. Here at Transparency International we have tried to make it a little easier – check out our brand new Financial Jargon Buster (you didn’t think we’d get on a treadmill for you, did you?). 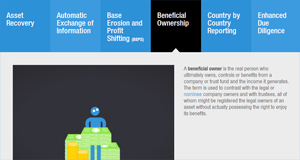 A beneficial owner is the real person who ultimately owns, controls or benefits from a company or trust fund and the income it generates. At the moment, in many jurisdictions companies are not required to give the details of who really benefits from them, which makes it easy to channel dirty money through shell companies, so it appears clean on the other side. We need to know who is behind a company to make it more difficult for criminals, money launderers and tax evaders to hide the source of their funds. A simple and cost-effective way to do this is for every country to collect this information in mandatory registers that are open to the public. In 2013, having presided over a G8 focused on transparency, the UK pledged to do just that. Looking to 2014, the European Parliament should be voting soon on whether to require member states to establish such registers, and right now the Cayman Islands and British Virgin Islands are conducting consultations on the same issue. We hope G20 countries will show leadership and formally agree to public registers before the end of the year. You can take action, too – sign the postcard to tell your Member of the European Parliament to crack down on corporate secrecy! 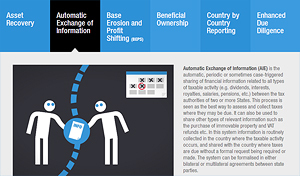 The term “Automatic Exchange of Information” (AIE) hit the news this year, but what is it all about? AIE is the automatic sharing of information between tax authorities of two or more states without the need for a request to be made. In the current system, you already need to know what you are looking for in order to make an information request to another tax authority. Automatic exchange just makes it a bit easier to tackle companies which are avoiding paying tax, for example via transfer mispricing. There was some good progress in 2013 – the G8 worked in parallel with the G20 finance ministers to push for automatic exchange of information to “become the global standard” and this was then adopted by G20 leaders in September at the St Petersburg Summit in Russia. The new standard will be presented at the G20 Finance Ministers and Central Bank Governors’ meeting in February 2014. Full technical details will be expected by June 2014. It remains crucial, though, that the new AIE standard enables developing countries to reap the benefits associated with AIE right from the start – which means making sure they participate fully in the consultation and that their capacities and needs are accommodated. Good luck with learning the new language, we hope the new Financial Jargon Buster will help! And if you are inspired, here are some more new year’s resolutions from our partners at the Financial Transparency Coalition!